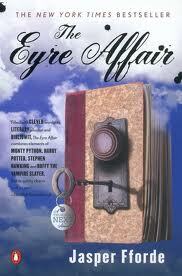 The world of The Eyre Affair is an infinitely intriguing one. It's past, present, future, speculation, fact, truth and fiction all rolled in to one. Filled with real authors, real novels with their fictional characters, and the fictional detectives in charge of both, it's a bit of a meta trip into literature, and a total joy for Victorian lit geeks like me, and book lovers in general. In Thursday Next, Jasper Fforde has created the kind of female character that I wish there were more of: intelligent, focused, driven, resourceful and completely at ease with time travel. Alright, that final characteristic isn't so much a personality trait as a learned necessity for coping with life in an alternate reality where air ships exist and the boundaries between fiction and reality begin to disappear, but still, it's an impressive quality to have. Also impressive to have? Her pet dodo, Pickwick. In Fforde's reality, it's an alternate 1985, and Britain is still at war with Russia over the Crimea. Thursday Next, a veteran and reluctant hero of the war, has been working as a LiteraTec, one of the departments in what is known as SpecOps. This isn't nearly as complicated as it sounds. It essentially means that Next is in charge of hunting down all of the crimes of counterfeit works and attempts of stealing original manuscripts in a world that cares infinitely more for literary works than our own does. Next is ready for a change, though, and when an opportunity arises for her to join another department, with more excitement and a higher clearance promised, she takes it. Little does she know that what is needed is her knowledge of the master criminal, Acheron Hades, a man devoid of conscience and for whom reason is not a prerequisite to crime. He's on the hunt for the ultimate weapon and he soon finds it, in Thurday's backyard, literally. Thursday's uncle, a nutty professor sort, named Mycroft, has invented the Prose Portal, a piece of technology which, through fascinating means, including actual bookworms, allows a person to step into any fictionalized world, whether it be a Byronic poem or a Bronte novel, and interact with the characters and the world as detailed in the novel. Machinery like this would allow people to, say, take vacation to Northanger Abbey and, after having tea and conversation with Catherine Morland, take a carriage ride back to Bath, or perhaps step into Hamlet and talk some sense in to Ophelia. But not everyone wants to use the Portal for good, as is always the case, isn't it? What the Portal would also allow is for people to step in to any novel and change the outcome, or bring back the weapons from that time to be used to change their real-life existence. When Thursday's uncle and his Prose Portal fall into the wrong hands, Next must fight not only Hades, but the long arms of the Goliath Corporation, in an attempt to keep both her reality and the world of Jane Eyre intact. It may sound a bit silly, and this work certainly doesn't take itself too seriously, but the questions behind it are some fascinating ones. Imagine a world in which your favorite novel doesn't turn out the way you have always known it to. What happens when Darcy rejects Lizzy at the end of Pride and Prejudice or when Romeo wakes up before Juliet drinks the poison? Just how much influence does literature hold over the formation of a culture? And, why, oh why can't I have a pet dodo too? This along with the ultimate question of good versus evil and a healthy dose of noir keep this mystery moving forward in an always-entertaining manner. As a fan of mysteries and Victorian literature, it was nearly impossible for me to go wrong with a work that not only combined the two, but also managed to throw in air ships, time travel, a Zoltar-like machine in which it's Shakespeare and quotes from his works being handed out, along with assigning an almost religious fanaticism to the question of "who was Shakespeare?" It's pure fun, along with a healthy dose of education, the will, perhaps result in a couple of more books to add to your "to-read" list. I know I haven't tackled Martin Chuzzlewit yet, but now, I think I might want to. Avid readers should certainly get a satisfying kick out of Next and the first installment of her adventures.